We would like to start off by telling you that FX Sniper Forex is a software which we deem to be a scam. It is for this reason that this software has been blacklisted after a thorough investigation which we outline in this review. 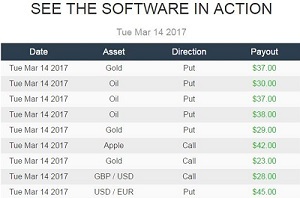 The software just has a sales page or a squeeze page as it is called, which claims that they have some sort of Forex software, but in fact, it has more to do with binary options brokers who give these scammers a kickback. The shady broker backing FX Sniper is Plus Option. Plus Option is an unregulated and as such an untrustworthy broker. Then there is a sales pitch that’s presented by an actor who in a very enticing manner tries to sell you the same. But this is also the same actor who played a part in another blacklisted scam named Profitball. In fact, if you look at it there is almost no difference between how both the scams are hatched. The scammers would like to think that they have some secret trading strategy that you can benefit from but in fact, that’s all just hype. The goal of these scammers is to deceive, manipulate and cheat. All they want is for people to register, and fund the account their broker who will then pay them a commission. Even after thorough research, we were unable to uncover anything genuine or legitimate about this app or trading bot as we’d like to call it. Though what we did uncover was a vast network of spammy affiliate links that kept sending us unsolicited emails and that’s something we’ve received complaints about. That said if you have willingly subscribed to their service then it’s time to unsubscribe now. Also, unsubscribe to any emails you receive from services related to them. Now the scam centers around a fictitious character named Mr. Simon Reed, who is supposed to be some kind of ’Expert Forex Trader”. He claims that using the system; anyone can make over $100,000 in just a couple of months. But this Reed character is a total sham! When we did a bit of research it was clear that Mr. Simon Reed was selling all different types of shady software across the internet, one of those is Profitball. So, this appears to be a brand new scheme setup by a well-known scammer, who is up to his old tricks again. Reed the so called ”Expert Trader” says that he made $100,000 in just a few months using the technique that he’s willing to share with everyone. Then right after we meet a woman named Nichole who puts up a fake testimonial to woo the audience. If anything we have seen this tactic been used by many other scams in the past. It is meant for the audience to identify with the person who talks about going from nothing to a lot of money via the classic story of a single mother who needed to pay bills but didn’t have money. Reed and his fake software is obviously her savior, and because of that according to her, she is making a lot of money without even lifting a finger. Reed makes a promise that anyone and everyone who uses this system will get out of a time-stealing and soul sucking employment system. So, this technology is supposedly changing lives, which we apparently don’t believe because we’ve heard all of this before. So how does this software work? According to Reed this so called software uses data sourced from ”decades of data” which according to him cannot be analyzed by a human. So, the software goes through all this data for a second, then makes a trading decision based on that historical data. All of this results in the trader being able to execute winnable trades and hence make money. Reed also tells people that everyone has access to his personal trading accounts so they can witness how the software works. Apparently, he alludes to it working live so people can see it in action. However, he suggests that if too many people find out about this so called loophole in the financial system, then it will be closed. It is pretty clear that Simon Reed is not a trader and is merely an actor reading lines. He has been paid to perform an act, but even then he isn’t very convincing. If anything many low level scams will use these techniques which include fake testimonials, hyped up videos, exaggerated winning claims and doctored bank accounts all in an effort to convince people they are legit. But in fact, it is all a big lie. This entire scheme and many similar ones are just there to steal your money, and so you’ll certainly not make money from them. Obviously, it will not be free. This so called software is going to cost you $250, and that’s if you’re lucky. The money is charged to your debit or credit card by their broker who does not care if you are already rich or poor. Their only concern is getting your money and then never replying to your emails again. Yes, they are called ”Honest Reviews” and many sites proclaim to be very honest. However, their honesty has a price, and so when these scammers pay them for a favorable review, they are willing to oblige. So, it is for this reason that you need to use common sense when evaluating these scams. The FX Sniper developed by a scammer called Simon Reed has very little to do with Forex but everything to do with trading binary options and that too getting scammed doing it with rogue blacklisted brokers. Honestly, what they are doing is selling snake oil, because there is no software and they can’t prove it works. If anything it is a junk piece of software which has been designed to steal money from people who are not even traders. We are so sure about this software that we can guarantee that anyone who invests money in it will end up with nothing. As a matter of fact, you will be lucky to even get a response back from these people. We have blacklisted it because we don’t want anyone getting scammed by it anymore. Additionally, we have received lots of complaints have conclusive proof it being a scam.